FREE COMEDY NIGHT TO HELP FIGHT STRESS, DEPRESSION, AND SUICIDE. Now in its Sixth year, ‘Living with Laughter’ and ‘The Sit Down Comedy Club’ once again join forces to present their ‘SHARING OF LAUGHTER DAY’ Free Comedy Event. In 2012 comedian Mark McConville created ‘Living with Laughter’ a not for profit organisation which started the “Sharing Of Laughter Day” initiative, an event to be held on the 10th of September each year to coincide with ‘World Suicide Prevention Day’. Anywhere and everywhere, in your Home, in the Workplace, in Schools, at a friend’s place, or even better still, attend a Stand-Up comedy show. All you need to do, is SHARE LAUGHTER with someone who you feel needs a boost, and in doing so, you may just help save their life. You’ll be doing a great thing for them, and a great thing for yourself. You can’t feel anxious, angry, sad or despondent when you’re laughing. 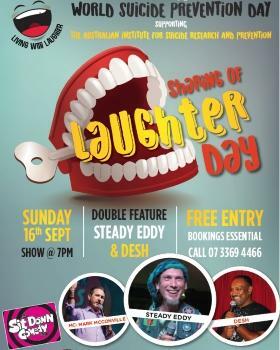 THIS YEAR, ‘Living with Laughter’ is bringing together the amazing talents of headlining Australian comedians Steady Eddy and Desh. Comedian and creator of ‘Sharing of Laughter Day’ Mark McConville will be your host for this fun filled night. IF THE SHOW IS FREE, HOW IS IT A FUNDRAISER? Each year we raise funds on the night as a result of donations from audience members. You are not obliged to donate anything should you not wish to, it’s totally up to you. Past recipients of funds have been, The Clown Doctors, Soldier On, and Lifeline. We are very proud to announce that this year’s event marks the beginning of an ongoing commitment to help raise funds for The Australian Institute for Suicide Research and Prevention (AISRAP) which is based at Griffith University. In 2004, the Institute opened the Life Promotion Clinic (LPC) at Griffith University’s Mt Gravatt campus. This was the first and remains the only outpatient facility in Australia focused on providing specialised treatment to people with a history of suicidal behaviour. AISRAP is also the only institute of its kind anywhere in the world, offering internationally recognised Post-Graduate Qualifications in Suicide Prevention Studies and a Master’s Degree in Suicidology. The Australian Institute for Suicide Research and Prevention is the leading Australian centre for providing high quality research, clinical practice, and education for the prevention of suicidal behaviour in Australia. We would like to acknowledge Fedele Crisci from The Sit Down Comedy Club for kindly donating the venue, advertising and ticketing for the fourth consecutive year, and also The Paddington Tavern for supplying staff for the night. Lastly, once again, we have been blessed by amazing talent putting their hand up for a worthy cause, our featured performers for the evening Mike Van Acker and Celebrity Magician Christopher Wayne for kindly donating their services for this year’s milestone ‘Sharing of Laughter Day’ FREE EVENT.